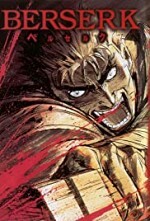 Watch Berserk: Guts was brought up by a mercenary group since birth. After killing his guardian in self-defence, he runs away. Years later, he encounters Griffith and The Band of the Hawk. The Hawks fight for the King of Midland, and after winning the 100-year war against the neighbouring Chuda, they become the King's personal guard. However, once they reach the top, things take a turn for the worse.